As a group of Mediterranean fishermen and women walked down the historic Cobb in Lyme Regis, holding out their hats against the waves breaking over the sea wall, I thought of the immortal image of John Fowles’ ‘French Lieutenant’s Woman’, standing at the end of the Cobb as waves crashed in. I was distracted by a shout from the inner harbour as scallop diver, John Shuker and his son Sam steered their boat towards the dock. Without hesitation, Federico Gelmi, a visiting fisherman from Pantelleria, a small island near Sicily, grabbed their lines and skilfully tied them up. There was an immediate and instinctive connection between the two fishermen who had never met or even set foot in each other’s country before. The quay erupted with questions in Italian, Greek, Turkish and various local dialects about catch, quota, gear, profit, weather and every other issue of daily concern to small-scale fishermen. John answered them all willingly and when Sam was asked if he would continue in his father’s footsteps, he jumped up to the top deck and said: “I can’t think of anything else I’d do – I’m a fisherman!” John was clearly proud. 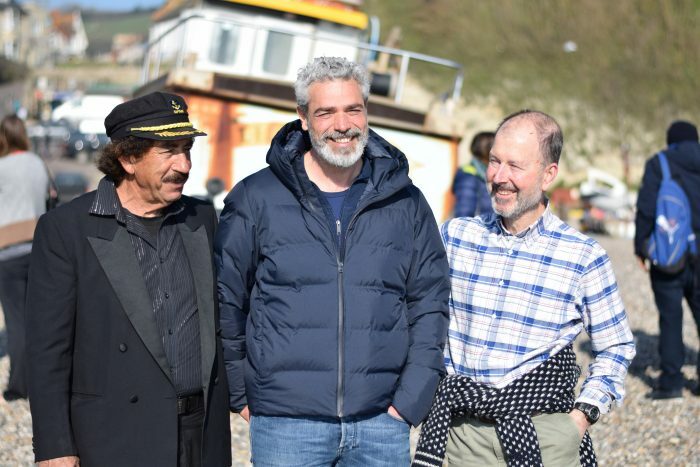 Left to right: Yiannos Stylianou (Cyprus), Federico Gelmi (Pantelleria), Brian O’Riordan (UK). 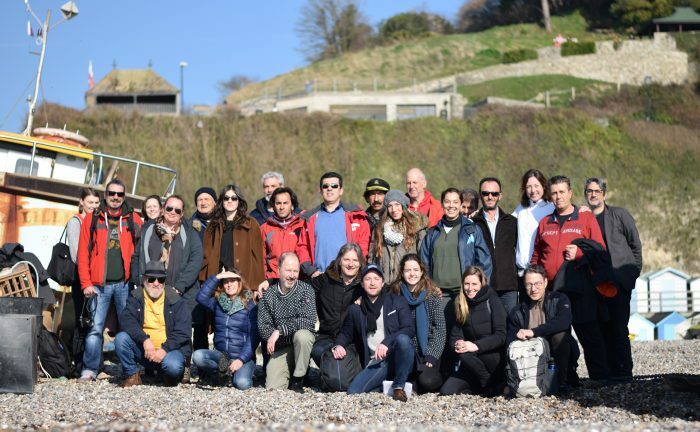 Blue Marine Foundation (BLUE) had invited a dozen artisanal fishermen from six small fishing communities in the Mediterranean to Lyme Bay. Many of the fishermen had never been on an aeroplane, some had never left their home country. They were a brave collection of seamen who wanted to learn more from the fishermen in Lyme. 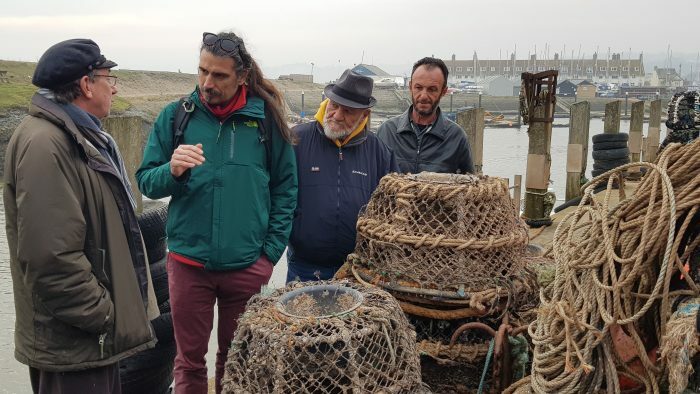 The visitors were aware of the remarkable recovery of marine life in the Lyme Bay Reserve and the superior quality of fish sold by Lyme fishermen after Gavin Ziemann, a fisherman from Axmouth, had presented at an event in the Aeolian Islands in the Autumn of 2018. Now they wanted to see the results for themselves. 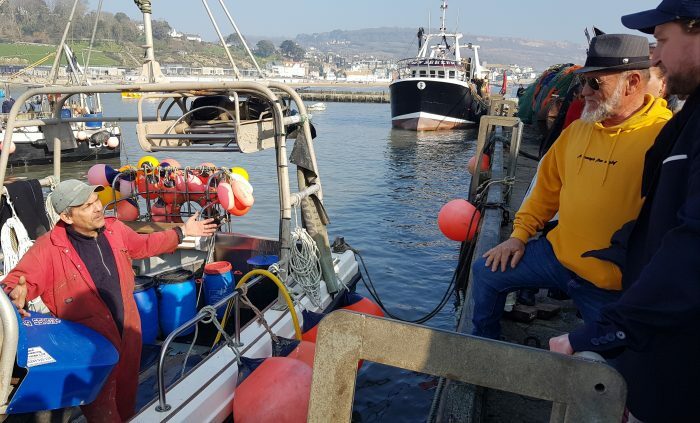 The visiting fishermen noted the peculiar shape of boats and carefully examined the cuttlefish pots as we made our way back along the Cobb to the Marine Theatre, where Saturday’s event would take place. Salvatore Follone, a seasoned fisherman from the Aeolian island of Salina was nostalgic: “We used to use pots like these when I was younger but there are not enough cuttlefish to fill them anymore,” he said. The Marine Theatre was bustling with life when the group arrived. Gavin Ziemann had arrived early with a vast array of fishing gear to show his guests. Pots, nets and cleverly tied lines hung from the stage. There were banners, flags, information boards and bunting – it was an inspiring scene with translators and film crews busy capturing the knowledge passing between fishermen. A large, insulated fish box was hauled in, stuffed with locally caught turbot, crab, lobster, scallops and whelks. Along with ice machines and chiller units, BLUE has provided the boxes so that fishermen can keep fish fresh at sea and thus improve quality and market prices. The ice was crisp and the fish almost flapping. Morven Robertson, BLUE’s UK senior projects manager took to the stage and began proceedings with an enlightening overview of the fisheries/conservation partnership in Lyme Bay, which has resulted in a recovery of the endangered pink sea fan, more fish, more lobster, more scallops and a resilient marine environment that supports the local fishing fleet. Participating fishermen abide by voluntary ‘Codes of Conduct’, which limit their impact on the reserve and ensure sustainability. 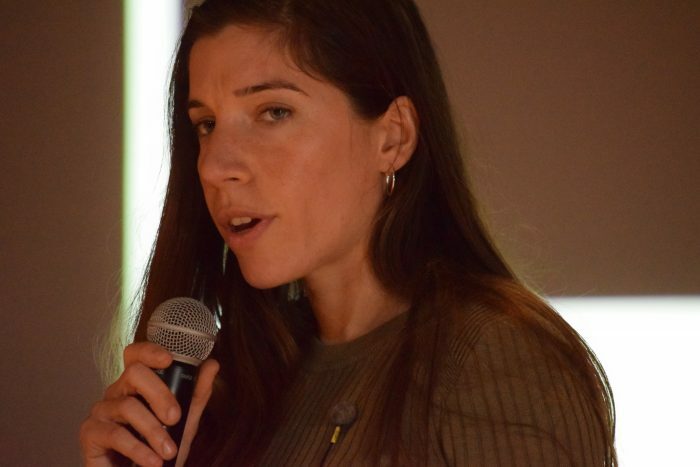 Morven was followed by Giulia Bernardi, BLUE’s Italian coordinator who is working with fishermen in the Aeolian Islands to replicate the ‘Lyme model’. 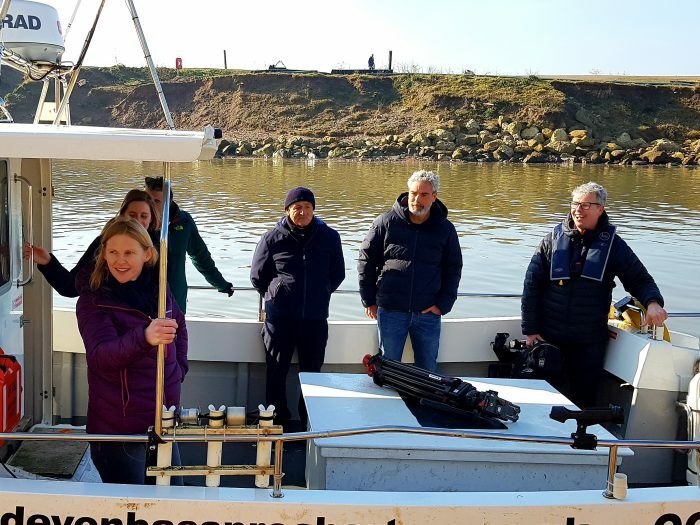 The three Aeolian fishermen by Giulia’s side had adopted their own codes of conduct and were eager to see the benefits of recovering fish stocks. 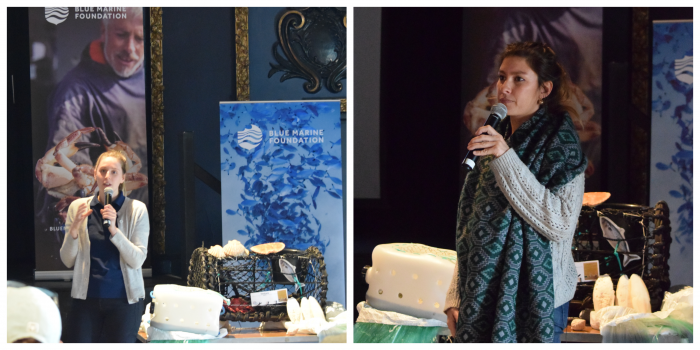 Each community took the stage in turn, describing the fisheries of Alonnisos (Greece), Santorini, Gokova Bay (Turkey), Cyprus and Pantelleria. 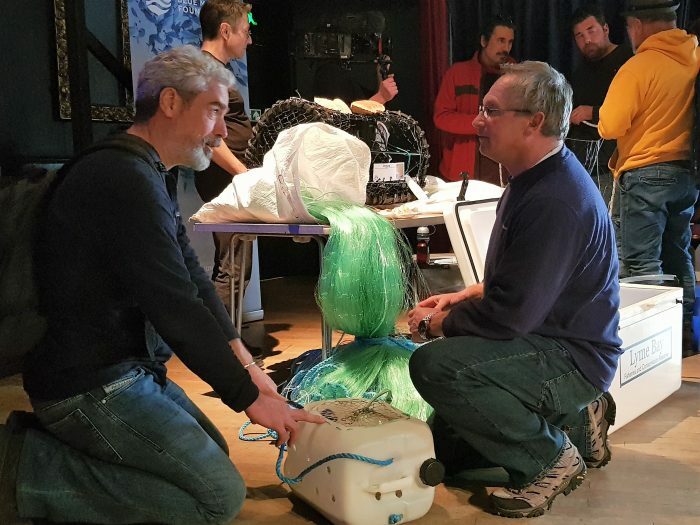 It seemed apparent to the Lyme Bay fishermen who had attended the event that perhaps the livelihoods of their guests were in a more fragile state than their own. Climate change, invasive species, chronic overfishing, disputed borders and unregulated recreational fishing, were all factors leading to the decline of Mediterranean artisanal fisheries and coastal communities reliant on fishing. Lunch was called and the multicultural audience introduced to pork pies, sausage rolls and egg sandwiches – all washed down with local cider. There was great astonishment and amusement when the cream teas arrived! Gavin Ziemann kicked off the afternoon workshops, describing the different kinds of fishing gear used in Lyme and discussing the details of the ‘Codes of Conduct’, which had helped restore fish stocks in the reserve. He was joined by Nigel March, who elaborated on infrastructure improvements and routes to market, which mean he can sell his fish at a premium. As John Shuker began to talk about the abundance of scallops in the bay, the audience was clearly affected. Stella Stylianou, the daughter of a fisherman from Cyprus looked sad as she made a poignant comment, “I think your fish boxes would be invaluable for my family in Cyprus but we just can’t catch enough fish to fill them – there are none left”. Nods of agreement came from every corner of the room. As the sun was setting and a chill filled the air, the guests wrapped up warm and discovered Axmouth harbour, where Gavin and his brother, Charlie Ziemann showed off their new ice machine chiller unit, stuffed with pollack and gurnard, waiting to be delivered to restaurants through the Lyme Bay Reserve Seafood Scheme. We were all at Beer beach before lunch to watch the Beer fishermen haul their boats up the steep pebble beach. The Mediterraneans had never seen such tides and looked astounded as the boats were winched onto the shore, rolling up the beach on logs placed under the hull. There were new fish boxes and ice machines but some things had remained the same for centuries. A great Sunday banquet was held at the Dolphin Inn at Beer, with sole and crab from the reserve served up. The fishermen had become good friends within 24 hours and phones showing pictures of huge fish were proudly passed around the tables. It was apparent that the Mediterranean was once a sea to behold. Images of great swordfish, tuna, amberjack, groupers and barracuda filled the screens, but I noted that they were snapshots of polaroids from the past – things had changed. I was amazed that the many language barriers did not seem to prevent communication between fishermen who were going to get their point across one way or another. They wanted to share and they wanted to learn. At one point I heard a strange melody and turned around to see Kyriakos, a fisherman from Santorini, singing traditional Greek sea shanties to a group of Sicilians. Veta, Kyriagos’ wife looked tearful. The translator was not needed. It was a moment that I will never forget. Gavin, who handled the weekend perfectly, got up on a picnic table and made a marvellous parting speech, thanking his newfound friends from the Mediterranean for visiting his home and promising to come and see them all soon. Gavin is going to have a busy year. As the fishermen departed, arms full of souvenirs from Lyme Bay: fossils, gin, biscuits and tea towels, I looked down to the Cobb and saw the figure of a woman, standing and watching the swell rolling in from the West. It was Stella, the Cypriot fisherman’s daughter. I will never know what she was thinking but I imagined it had something to do with filling her family’s fish boxes with fish. We will do our best to help her.